The City of Albuquerque’s BetterHealth program is continually looking for new communication methods to reach all City of Albuquerque employees, especially employees who do not have city email accounts or daily computer use. A new communication method we tried this year is JohnnyBoards Indoor media. 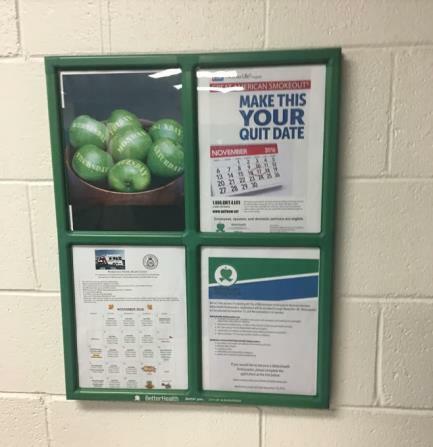 Every month JohnnyBoards places BetterHealth awareness campaigns in select restrooms, near water fountains and time clocks. The great thing about this media is that it’s an effective and affordable way to get in front of Employees who are captivated for 30 seconds to as much as 4 minutes.No other media can be placed where it is truly unavoidable. When asked to rate the effectiveness of JohnnyBoard ads in providing information about specific programs, at least 67% rated JohnnyBoards extremely or very effective. When asked if the JohnnyBoard ads encouraged them to participate in specific programs offered through Insurance & Benefits and the BetterHealth Worksite Wellness Program, at least 71% said yes.